The roots of the company stretch back over 200 years to the beginning of the English china industry. The company's impressive history is dotted with the names of Queen Victoria, Louis Pasteur, and King Edward VII. From its humble origins on the banks of the Thames river, it grew to become the premier name in water filtration. On the eve of the Battle of Waterloo in 1815, John Doulton was taken into partnership by the widow Martha Jones who had inherited from her late husband a pottery in Vauxhall Walk, Lambeth, by the side of the Thames river. Her foreman John Watts was included in the partnership and the new firm became Jones, Watts and Doulton Company. 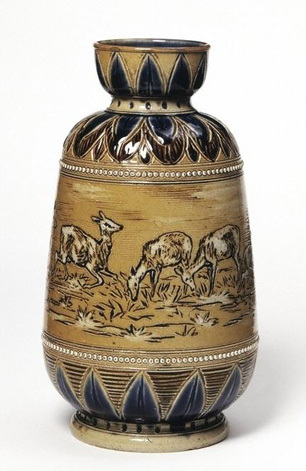 John Doulton founded his first pottery that same year, 1815, at Lambeth, England on the banks of the Thames river. The main products of the original company were ceramic busts, figurines, canning jars and tableware. Influenced by the unrelenting progress of the Industrial Revolution, Doulton placed equal emphasis on industrial applications for ceramic technology. It was John Doulton's son, Henry, however, who carried that tradition of the Lambeth pottery to its zenith. As early as 1827, Henry Doulton developed ceramic filters for removing bacteria from drinking water. "Offensive to the sight, disgusting to the imagination and destructive to the health"
This was how London drinking water, drawn from the Thames, was described in a pamphlet published in 1827. The Thames was heavily contaminated with raw sewage; cholera and typhoid epidemics were rampant. The first Doulton® water filters were made using various earth and clay materials. By the time Queen Victoria came to the throne, Doulton was well established as a manufacturer of domestic and industrial products in a fine stoneware body that bore comparison with any in Europe. In 1835, Queen Victoria recognized the present health dangers in her drinking water and commissioned Doulton to produce a water filter for the Royal household. Doulton created a gravity fed stoneware filter that combined the technology of a ceramic filter with the artistry of a hand crafted pottery water container. By 1846, the Lambeth factory was in the vanguard of the revolution in sanitation technology and products which Chadwick, and the great reformers of the day, brought to metropolitan England. Without the hard work and foresight of Henry Doulton that revolution would have been delayed by decades. Henry Doulton introduced the Doulton® Manganous Carbon water filter in 1862, the same year that Louis Pasteur's experiments with bacteria conclusively exploded the myth of spontaneous generation and proved that all microorganisms arise from other microorganisms. Louis Pasteur's research into bacteria made it possible to focus the efforts of Doulton Filter's Research and Development toward the creation of a porous ceramic capable of filtering out these tiny organisms. With Pasteur's advancements in microbiology, Doulton's Research and Development department, headed by Henry Doulton, created micro porous ceramic (diatomaceous earth) cartridges capable of removing bacteria with better than 99% efficiency. Doulton Filters were rapidly adopted by the military, Crown Agents, hospitals, laboratories and domestic users throughout the world. In 1862, Doulton filters shown at the Kensington International Exhibition proudly wore the Royal arms of Queen Victoria. In 1882 Henry Doulton acquired a small factory in the Midlands, motherland of the Staffordshire potteries and the home of the Doulton Drinking Water Purifier. In 1901, King Edward VII knighted Henry Doulton and in 1902 King Edward VII conferred the double honor of the royal warrant and the specific—as opposed to the assumed—right to use the title "Royal" for his work on drinking water filtration. This Royal Warrant authorized the company to use the word ROYAL in reference to its products. Along the way the honors were won at the great international exhibitions in Chicago and Paris and the range of products proliferated. Queen Victoria bestowed upon Doulton the right to embellish each of its units with the ROYAL CREST. In 1906, Doulton introduced a filter that proved to be equal to the one Louis Pasteur had developed in France. It was rapidly adopted by hospitals, laboratories and for use in domestic water filtration throughout the world. The popularity and effectiveness of even the early 20th century designs has resulted in their continued use world wide. The range and efficiency of Doulton® domestic water filters have been widely extended over the years to meet the demands of increasingly sophisticated uses. Doulton® ceramics are now in use in over 150 countries. In 1985 the British Berkefeld® brand was acquired by Doulton Industrial Products, the manufacturer of Royal Doulton® water filters, a company whose name has been synonymous with high quality and reliability since the early years of the twentieth century. Today the British Berkefeld® name is the preferred choice for water purification products in world-wide locations where outbreaks of illness are associated with unreliable water supplies. The Royal Doulton Visitor Center was opened in May 1996 within the heart of the Royal Doulton factory in Burslem, Stoke-on-Trent, the "Mother Town" of the Potteries. Visitors walk through original factory buildings dating back to the mid-nineteenth century, which have been beautifully refurbished as the Home of the Royal Doulton Figure. In July 1998 the Visitor Center was named Visitor Attraction of the Year in its category by the Heart of England Tourist Board.